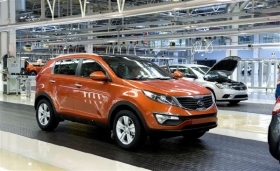 Kia will launch volume production of the Sportage on July 28. BRATISLAVA, Slovakia (Reuters) -- Kia Motors Corp. said on Wednesday its first-half output in Slovakia rose by more than 67 percent, driven mainly by a launch of the Kia Sportage and ix35 from sister brand Hyundai. Kia Slovakia, which has an assembly plant in the northern Slovak town of Zilina with an annual capacity of 300,000 vehicles, was the euro-zone country's fourth-biggest exporter last year. Production at the Slovak site reached 107,000 vehicles in the first six months of 2010, the company wrote in a handout to reporters, reiterating its full-year plan of more than 200,000 cars, up from 150,020 manufactured in 2009. The Slovak car industry, which includes assembly plants run by Volkswagen AG and PSA/Peugeot- Citroen SA, is a key driver of the heavily export-reliant economy, which contracted 4.7 percent in 2009 and is expected to grow between 3 percent and 4 percent this year.